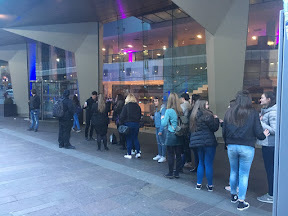 STITCHES singer Shawn Mendes got hundreds of screaming youngsters to line up outside his hotel as he held an impromptu selfie session in Glasgow. Heartthrob Shawn, who performs at the SSE Hydro on Thursday for the start of his 2017 world tour had spent the day inside the venue rehearsing with his team. Shortly after eight pm he emerged from the back door of the venue and made his way to his hotel in his silver people carrier only to be met by a mob of fans. 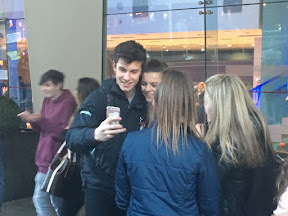 Instead of shying away from them, they were asked to form an orderly queue while Shawn posed for selfies with each one of them. 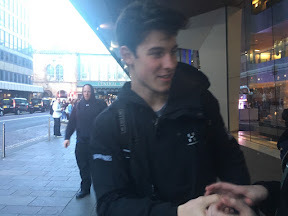 Shawn, who has been here for a few days and even managed to check out some of the cities bars while he's been here said: "It's great to meet everyone in Glasgow. I love you guys." The 18 year old Canadian singer has just streamed his new single There's Nothing Holdin' Me Back. His tour will take in places including Manchester, London, Germany, Spain and Portugal before heading to Canada then Stateside.